Thanks to Local 856 Principal Officer Peter Finn and Local 986 Principal Officer Chris Griswold for their generous donations to the relief effort. We would also like to send a special thanks to the many folks here at SFO who have brought in supplies and cash donations and also volunteered their time to aid in the effort help fire victims and their families. It is extremely gratifying to all of us to witness how consistently the membership steps up to support communities in need whenever there are tragic events such as these. On October4th, a large contingent of Teamsters and other Union members from across North America flew to Puerto Rico to assist in the aftermath of Hurricane Maria. The hurricane devastated the entire island, leaving its people without food, water, electricity, medical supplies, transportation, and shelter. The group flew on aircraft provided by United Airlines for a trip that lasted two weeks. The large contingent, which included over 70 Teamsters from a variety of Locals across the country, were on the island for two weeks aiding the cleanup, supply distribution, and in any other way they could. The Teamsters Union Sept. 8 sent a fleet of 6 of its big rig show trucks to Houston, Texas loaded to the gills with vitally needed supplies for Teamster Hurricane Harvey victims. Teamsters Joint Council 42 President Randy Cammack said "we collected everything from water to baby food to diapers to dog food and drove it from Local 63 in Fontana, California to Houston in 30 hours." In Houston, Teamsters Local 988 warehoused the donations and began distribution to needy families. Teamster Local Unions whose trucks made the Houston trip included Joint Council 42, Joint Council 7, Local Unions 63, 542, 630 and the truck jointly owned by Las Vegas Teamster Locals 14, 631 and 986. Teamster members and retirees donated the lion's share of the needed supplies. Teamster drivers volunteered to drive the trucks and had highway patrol escorts through California, Arizona and New Mexico. 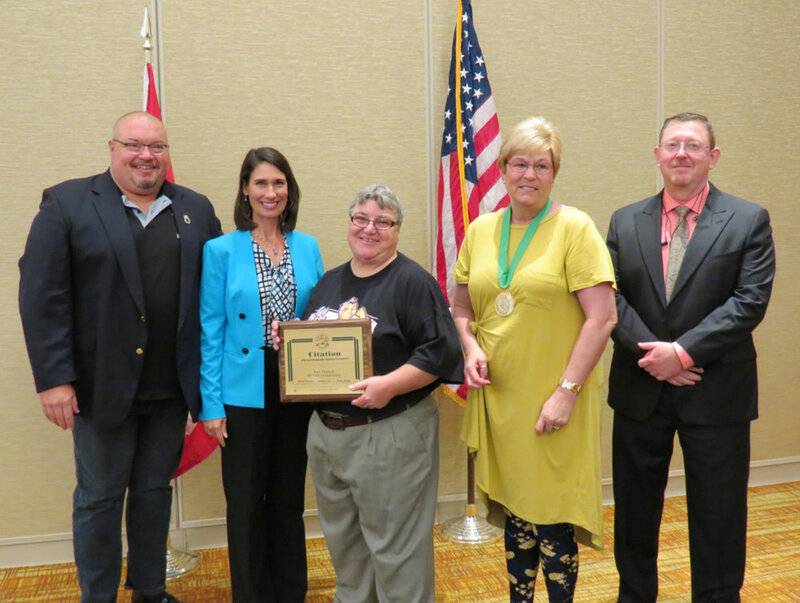 On September 22nd, 2017 at the National Safety Council Labor Division meeting in Indianapolis, IN, at the awards luncheon, Kasi Tkaczyk received the NSC Labor Division “Award of Merit” for outstanding service to safety. The award recognizes the individual’s meritorious service to safety, working to prevent accidents, promote safety, encourage and stimulate effective safety efforts within the Union and with management in the workplace. Since Kasi joined the Teamsters SFO Ground Safety Committee in July 2010, she has worked tireless to ensure that United Airlines in OV provides a safe and healthful workplace. Kasi has dedicated many hours over the last seven years on projects such as full tank entry, proper use, setup and inspection of scaffolding used in the WiFi project, getting United to build various Aircraft access stands, working to ensure annual evacuations drills are scheduled in OV and relentlessly working to make sure that United provides annual hearing testing to workers in OV. Kasi’s spirit, dedication and perseverance to safety and health exemplify her commitment to working and helping protect our Teamster Union Brothers and Sisters. Congrats Kasi! For members in the SF Bay Area Local, 856 will be having Thanksgiving meeting on November 2nd at 6pm. The meeting will be held at the Best Western Grosvenor Hotel located at 380 South Airport Blvd in South San Francisco. Kaiser Permanente will be on hand to provide free on-site flu shots starting at 5pm. For members in the Sacramento area, the Thanksgiving meeting will be held on November 16th at 6pm at the International Association of Aerospace Workers Local Lodge 946 located at 2749 Sunrise in Rancho Cordova. Please join us for giveaways, raffles, and prizes! Additionally, we will be collecting unwrapped toys and non-perishable foods at both meetings to donate to the San Mateo Central Labor Council hardship fund to assist Union families in need this year. The Holiday Season is fast approaching. This time of year can bring all kinds of emotions and feelings that may be difficult to process. It may be that you have a Family function every year that tends to get out of control because of some underlying family tension or emotional distress. Or you have some memories of loved ones who have passed on that become especially hard to deal with at this time of year. Maybe it’s yours or a family members drinking problem that seems to get worse during the Holidays that is causing you concern. These are just a few of the things that may cause stress and fatigue at this time of year. If you need someone to confide in about different life events that may be affecting your duties at home or at work and would like to seek help with developing a plan to work through some life events, call one of our Member Assistance Professionals. We have helped a lot of technicians find appropriate resources to start the path of recovery from Grief and Loss, Alcohol/Drug Dependency, Relationship problems and many others. The Teamster Member Assistance Program is here to help 24/7/365. If the Holidays have you down, give us a try before it has adverse effects that may be irreparable at work or at home. Ariecibo, Puerto Rico. She organized tobacco and other agricultural workers in Puerto Rico and later in New York and Florida. In 1916 she led a successful sugar cane strike of more than 40,000 workers on the island. She demanded that her union endorse voting rights for women. In 1919, three years before her death, she was arrested for wearing pants in public, the first woman in Puerto Rico to do so. The charges were later dropped. October 30th, 1912 - Little Falls, New York, mounted police attack striking textile workers – mostly immigrant women and girls – beating some of them unconscious. The police chased the fleeing workers to their strike headquarters, continuing their assault, ransacking the building, destroying their union charter, and arresting the entire strike committee. Despite this, the workers saw the strike through until January 1913, when they won an agreement that included reinstatements, wage increases, and other demands. The communication process is an extremely important part of what we do to represent our folks here at SFO and, as we have been outlining for quite some time, we have been blasting out the BA Report along with any other communication we get from the Airline Division or the International to anyone who registers at the TeamstersSFO website. Additionally, there are weekly meetings held with the Shop Stewards to pass on any important informational items that may come up during the month. It is crucial to our process that every area on every shift have Shop Steward representation and that the Shop Steward give, at a minimum, weekly briefings to his/her crew so that all the information gets to our members. We feel that it is essential for all of our members to be engaged and informed at all times. Therefore, we encourage all of you to spread the word to your fellow technicians to go to the TeamstersSFO website and click on the ‘email signup’ tab to get on the list. And, most importantly, we urge you to also consider getting more involved. Every month, on the last Thursday, we hold Craft Meetings at Local 856. At these meetings, the membership hears reports from the Business Agents and other members of the SFO Committee on Grievances, Safety, Member Assistance, and TSAP. Additionally, all members have an opportunity to ask questions and to bring up topics for discussion. Check your IBT Bulletin Board for dates and times and make it a point to stop by.